WARNING- This response contains numerous SPOILERS for the book. 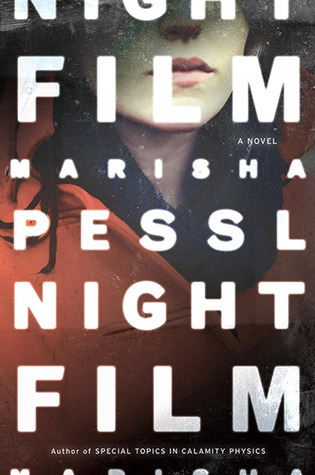 This book, “Night Film” by Marisha Pessl, was basically two mysteries in one. The first one was the investigation into the activities of Ashley Cordova in the weeks prior to her supposed suicide. The second mystery tied into the first and concerned the history and activities of her father, famed reclusive film maker Stanislas Cordova. The narrator, Scott McGrath is an investigative reporter who attempted to write a story on Stanislas some years prior, but ended up being professionally disgraced. He becomes drawn into the web of Ashley and is aided by a friend of Ashley’s, Hopper and Nora, who was one of the last persons to see Ashley alive. They all have their own reasons to want to know more about what happened to Ashley and this very unlikely crime investigation trio is formed. The mystery around Ashley deepens, concerning her breakout from a psychiatric facility a couple weeks prior to her suicide in an abandoned building and her activities up to her suicide. The mystery is an entertaining one and grows darker the more the trio discover about Ashley. Scott takes the opportunity to restart his investigation into Stanislas with the belief that something dark happened in Ashley’s childhood tied to Stanislas’s dark personality and films that ultimately lead to her suicide. Stanislas is a famed, but reclusive and secretive, horror film maker. He hadn’t been seen in public since 1977 and he seemingly confined himself and his family to his large estate in the Adirondacks, called The Peak. He constructed movie sets on his property and filmed all his movies there in secret, and no one who worked with him would really talk about it. For reasons that are never fully explained, Stanislas’s last several films were never released to the wider public, but only through secret red band screenings among his devoted followers. The book intimates that Stanislas’s work is so horrifying that it can never be released to the public, and even inspired copycat murders. Scott believes that Stanislas has engaged in all sorts of violent, nefarious activities, many of which involve children, but he has no proof, and hopes that his investigation into Ashley will lead to further knowledge of Stanislas. About halfway through the book, the mystery around Ashley suddenly progresses from rational to supernatural and points to very dark, occult activities around Stanislas and Ashley. This is when the book takes a turn for the odd. I enjoy paranormal and supernatural stories, though it is a bit jarring to see those elements included in a story that was a more straight forward, if creepy, murder mystery. Scott, Hooper and Nora decide to break into The Peak to see what they can find, but frankly, not much of consequence is found. Many words are expended on this part of the book, but little payoff. Just when the author wants to have you convinced that the devil really possessed Ashley and claimed her, she has Scott meet Stanislas’s lifelong assistant, Inez Gallo, and she tells him that Ashley was not claimed by the devil at all, but rather she was dying from leukemia and she was desperate to keep that information hidden from anyone not in her family. The book takes pains to present both the rational and supernatural explanations of Ashley to be plausible and not necessarily mutually exclusive. The mystery is never fully resolved, but I feel is left up to the reader to make their own assessment of what really happened to Ashley. Where the book does fall short in my opinion is the mystery surrounding Stanislas. The author raises so many intriguing questions around Stanislas, and she really ratches up the tension and the fear in her writing. Did Stanislas worship the devil along with his neighbors? Did he kill children in the hopes of exchanging the devil’s curse from Ashley to them? What was going on with his movies? What was going on with him? Ultimately this book raises so many questions, but fails to really answer any of them. We never actually know anything for sure. The author leaves enough doubt about the devil worship that you don’t know what to believe. There are intriguing suggestions that the horror in Stanislas’s last several films was actually real and not fake. All of his movies are supposed to be deeply disturbing to the psyche and leave one shaken and horrified. While there are some descriptions of the movie plots, none of them sound so terrifying that a studio would not release them. There just isn’t much explanation as to WHY his movies are underground. Were they actually snuff films? What sort of hold did Stanislas have over people, because he certainly was painted as deeply sinister. I felt the ending was particularly flat. There were suggestions that Scott was really in a Stanislas Cordova movie, that he was being manipulated by Stanislas, and he was looking for clues and fakeouts. But if that was really the case, you would expect some serious twist at the end that shocked you and turned everything you believed upside down. I was prepared to find out that Ashley didn’t commit suicide, but rather was murdered (that apparently wasn’t the case). I thought maybe we would find out that Ashley faked her suicide and she ran away to South America with Hopper (nope). I thought we would find out what REALLY happened to Scott, Hopper and Nora when they went to The Peak and why Hopper and Nora wanted to end the investigation right after returning (not a chance). I was deeply hoping to find out the truth about Stanislas (if only). In that respect, I think the author failed in the ending. Scott was letting the case go and getting on with his life. Then after his talk with Inez, he had an inspiration about mermaids that connected The Peak to a small island in southern Chile. Scott ends his journey on an isolated side of this island and he enters a house where a man is waiting for him, presumably Stanislas, and Stanislas is willing to talk to him. What they actually talked about we never know, but Scott basically said he would listen to Stanislas’s truth, and that was that. We never actually knew what his truth was. I suppose the author’s entire point is that one can never fully know the truth about anything or anyone (or at least that is what I think she was trying to say). But if you write hundreds of pages of story and expect readers to commit hours to read your book, I feel you should actually deliver and answer some of the questions you raise. Overall the writing was tense and frightening (I mean that in a good way). The case was interesting and the potential implications spooky, both the natural and supernatural possibilities. I liked the multimedia approach to this book of incorporating blog posts and articles and it increased the knowledge of the characters. I wanted to know more about Stanislas and what he was really about. I wanted to know about his secret world and his movie making. Unfortunately I don’t think there was enough resolution in the story to make the payoff worth reading the entire book. I don’t think the author fully developed all the story strands and would raise plot points only to leave them hanging. While the plot was interesting, there were also numerous plot holes. Great idea, and good initial execution, but poor ending.